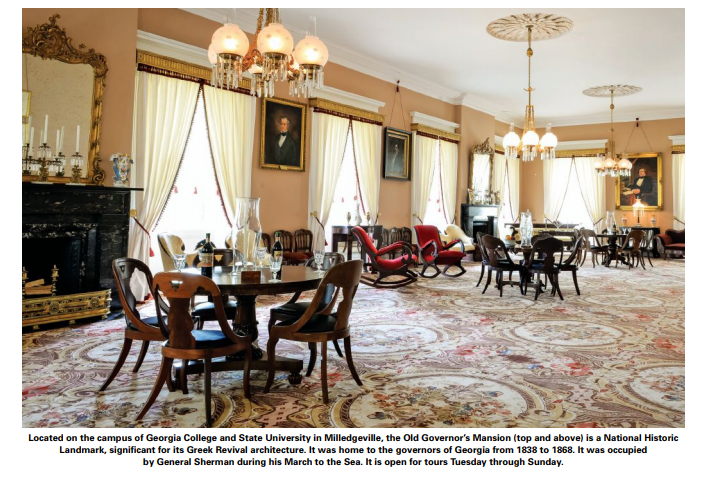 Article originally appeared in Winter 2017 Georgia Connector. To walk into a historic home is to be surrounded by the past. An older sense of aesthetics – somehow deliciously nostalgic and foreign at the same time – stirs the imagination. We marvel at the lives of those who came before us, their struggles and accomplishments. We ponder life before our familiar social norms and technology. What was it like to live here? Three quarters of a century ago, Virginia Lee Burton tapped into these sentiments when she published a story that speaks to all ages, The Little House. In this Caldecott winning book, a man lovingly builds a home atop a small hill. As readers turn pages, time slips by. A city forms in the distance and expands ever nearer, adjoining fields sprout houses, and transportation methods change. Before long, the home is lost among urban bustle. Thankfully, someone finally slows down enough to appreciate the Little House. The enjoyable story is made yet richer by realizing that The Little House echoes thousands of true stories playing out in slow motion all across the country. Sadly, many examples of Georgia’s abundant architectural past are now without someone to truly appreciate them. Each year, more are lost to the bulldozer or by simply decaying under many seasons of kudzu vines. The good news is that many caring citizens preserve some of these treasures. These culture heroes are aided by the National Register of Historic Places, an official list begun in 1966 that inventories places worthy of saving. The register’s webpage offers a database searchable by state, county, and city. Here, preservationists, potential buyers, and history lovers can find listings of local historic homes. Entries include photos and details such as architect names, architectural style, and important dates. In the age of smart phones, one can read about a house while standing in its shadow. The register encourages towns to not only preserve but also showcase their historic homes. The local welcome center, convention and visitor’s bureau, chamber of commerce, or historical society may compile lists or even suggested routes for walking and driving tours. These organizations may also know about local home tour events and historic properties now used as special event venues. A little sleuthing may turn up fascinating houses you didn’t know about in your area. 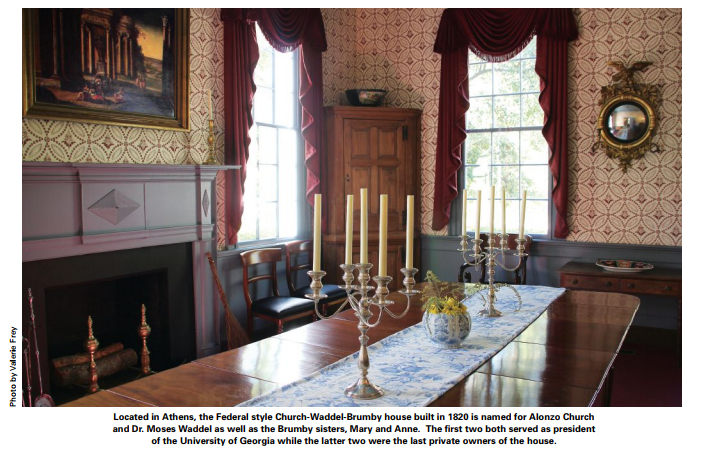 Some of these fascinations can be found in nearby Washington, which boasts more “antebellum homes per capita than any other city in the United States,” says John Singleton, chamber and tourism director of Washington-Wilkes County. The sad part of the story is that he doesn’t know how much longer this will be true. Washington-Wilkes has two homes listed as national landmarks, of which there are only 49 in the entire state of Georgia. To Singleton’s delight, one such landmark, the Tupper-Barnett House, a Federal style home built in 1832, is being restored to its grandeur. “Thankfully to the dedication and meticulous attention to detail of the owner and his contractor, the Tupper-Barnett Home will be around for future generations to appreciate and enjoy,” states Singleton. Visiting old homes can be addictive and soon explorers crave to know more. A Field Guide to American Houses by Virginia Savage McAlester is an excellent source for learning about domestic architecture. The volume is, however, a whopping 880 pages long. How to Read Buildings by Carol Davidson Cragoe is a better size for details on-the-go; if you are using your smart phone on history travels, Realtor Magazine offers a laymen’s online “Guide to Residential Styles.” If furnishings and the decorative arts appeal to you, your local reference librarian can help you find books about various periods and styles. They can also help you find local history books or connect with the nearest historical society.